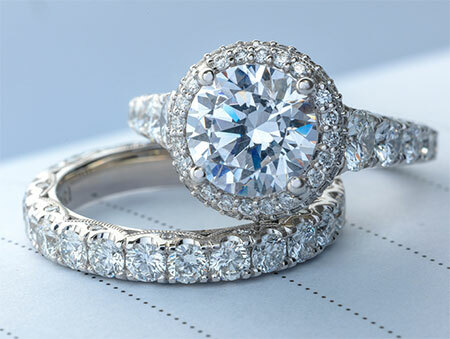 You can see the passion in the fashion of Tacori engagement rings and wedding bands. This is what sets the brand apart, and is so infatuating. Delightful details in a number of styles, personal craftsmanship by artisans in the Tacori California-based design studio, and unsurpassed beauty deliver the Tacori Touch, exciting brides-to-be of all ages all over the world. The signature ring collection is marked with a luxurious motif: the crescent silhouette, interlocking half-moon arcs that provide windows of light to reflect the brilliance of the diamonds placed within each semi-circle. You’ll find radiance from every angle of Tacori rings, from the foundation to the ceiling, inner face and resting point, a well as an incredible aerial perspective. Collections reveal classic, contemporary, elegant, modern and sophisticated designs, all of which have heirloom appeal.